It’s only been a month since we celebrated National Pizza Day, but thanks to mathematics, countless restaurants and bakeries are slashing prices once again today in celebration of March 14th, aka Pi Day. Basically, if it has the word pie in it, you can probably find someone who is selling it for a fraction of its regular price today. Before we go any further, we have to warn you that the deals we’ve listed below will only be available at participating locations. So before you rush out to grab your free (or cheap) pizza, be sure to call ahead and see if your local store is joining in on the fun of Pi Day this year. Better safe than sorry, especially when free pie is on the line! BJ’s Restaurant & Brewhouse: Dine in and get a mini one-topping pizza for $3.14. Blaze Pizza: Build your own custom pizza for $3.14. Limited one per guest, dine-in only. 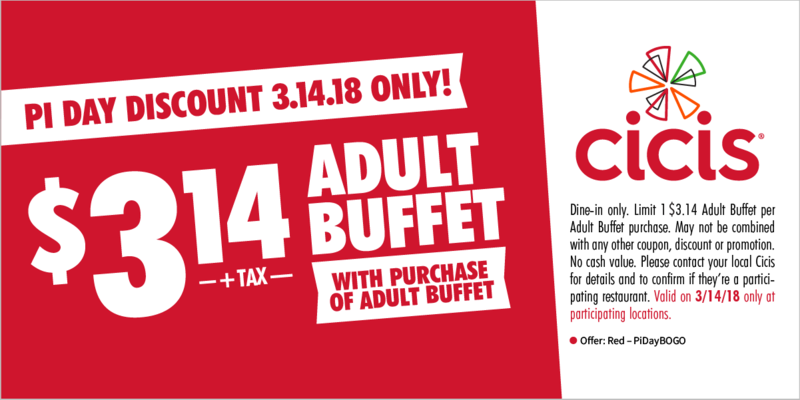 Cicis: Buy 1 Adult Buffet at regular price, get a second Adult Buffet for $3.14 with this coupon. Giordano’s: Get $3.14 off any online order with code PIDAY314. Hungry Howie’s: Buy any Howie Bread at regular menu price, get a medium one-topping pizza for $3.14 with promo code PI18. Offer valid on Tuesday and Wednesday. Papa Murphy’s: Get one large, thin one-topping pizza for $3.14 when ordering online. Pie Five: All specialty pizzas are $3.14. Pieology: Sign up for Pie Life and receive a coupon for a $3.14 pizza with the purchase of any regular priced Custom or Chef Inspired 11-inch thin crust pizza. Urban Bricks: Get any pizza on the menu for $3.14. Your Pie: Dine in to get a pizza for $3.14. Bojangles: Get three Bojangles’ Sweet Potato Pies for $3.14. Boston Market: Buy one Pot Pie and a drink, get one Pot Pie for free with this coupon. O’Charley’s: Get a free slice of pie with the purchase of any dine-in entree. Pick ‘n Save: Pick up an 8-inch Apple or Strawberry Rhubarb Pie at your local #MyPicknSave for just $3.14 with your Fresh Perks card. Whole Foods Market: $3.14 off large bakery pies, while supplies last. In addition to all of the locations listed above, be sure to poke around and call your local restaurants for more deals. We will do our best to keep this list up to date throughout the day as well, so don’t forget to check back here later and see if there are any deals or freebies you might have missed the first time around.